I didn’t start out to find why some natural treatments for rheumatoid arthritis can boost your health. I didn’t even care about their potential benefits and their pitfalls. I, a scientist with RA, just wanted to get better... to get my life of dancing, gardening, hiking, cooking, canoeing, playing with my daughter and husband, and sewing back again. Rheumatoid Arthritis is a challenging disease. I know. I had rheumatoid arthritis for 38 years. RA patients, like you and me, often traipse from one physician to the next, having varied success with the different treatments. When RA saddled me with excruciating pain and no end in sight [Physicians had given up], I took the ultimate challenge to finally explore natural treatments as a scientist. I searched scientific literature, reviewed many clinical studies, listened with an open mind to complementary and integrative medicine MDs and other healthcare professionals, and tried scores of complementary and alternative treatments. Then I applied my scientific training (Ph.D. in Immunology) to make sense of them all. I found many true RA facts well presented in many books, websites, physicians and healthcare practitioners. For example, Rheumatoid Arthritis is a degenerative disease of the joint. Secondly, your immune system actually attacks your joints in rheumatoid arthritis and causes swelling, tenderness and pain. Other organs and tissues can be affected later. This is why rheumatoid arthritis is defined as an autoimmune disease. Most prescription drugs for RA try to decrease your inflammation and / or stop your immune system from attacking the cells in your joints. Your cells in your swollen, painful, arthritic joints are NOT normal according to many scientific papers published in prestigious journals. For example, the cells that line your RA joints, grow more rapidly than normal. These cells lining your painful joints look and act more like fibroblasts, instead of themselves. These abnormal cells trigger your immune system to attack. Likely, your immune system aims to remove the cause of abnormal cell behavior, replace these abnormal cells with normal ones and heal your joints. In fact, some scientists think that your swollen, painful joints are part of a failed attempt to heal your body. So, I embarked on a quest to discover what causes cells in RA joints to become abnormal and trigger the immune system to misfire. Or, what causes rheumatoid arthritis to flare. Each flare meant something signaled for more swelling and pain in your joint. And moe inflammation and immune cell activity. I began checking the different possible causes on myself and reviewing the literature. Then searched for ways to begin helping my body to heal. So far, I've found 36 likely triggers for RA flares. 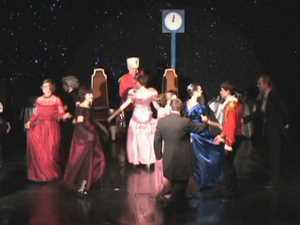 Applying these new views, I went from barely walking-- hobbling with a cane, no gardening, no dancing, constant, often excruciating pain, swollen fingers, stiff elbows and wrists, crossed toes, brain fog, ... to dancing a small part in a local production of Nutcracker ballet! Here I am on the left in the red dress. We're dancing the Minuet. Because friends and colleagues asked me how I've improved my health, I’m building this website and writing a book to share information about RA. I hope that this info opens a deeper understanding of your RA and overall health, helps you find some relief and replaces your frustration and despair with skeptical optimism. Please note that this website is a sharing of information and knowledge from the research and experience of Dr. Molnar-Kimber and her community. It is not intended to replace your one on one relationship with a qualified health care professional. It also is not medical advice. However, it is often observed that patients who take a major interest in their disease and learn as much as they can about their disease and potential treatments often improve faster than those who don’t. Dr. Molnar-Kimber encourages you to make your own health care decisions based upon your own research and discussions with your qualified health care professional. Scientist with RA has mission to help rheumatoid arthritis patients heal by providing first hand knowledge and clinical review of alternative treatments. Are you ready? Ph.D. scientist reveals her journey with rheumatoid arthritis—including 9 life changing perspectives, and 16 tips and tricks on finding the best treatments for you. Rheumatoid arthritis is often a chronic, frustrating disease, causing you much pain. Send your questions, concerns, observations to Rheumatoid-Arthritis-Decisions.com for information. Disclaimer for Rheumatoid-Arthritis-Decisions.com strongly recommends that you discuss any potential changes with your healthcare provider to assess its risk to you and your RA symptoms. A few spontaneous emails of thanks for methods to help the pain subside. They inspire me to continue writing. At least 54 triggers ignite RA flares and induce RA symptoms. An arthritis consultation with K. Molnar-Kimber, Ph.D. helps you identify your triggers and develop an action plan for resolving them. Laugh, take notes and get choked up when Dr. Molnar-Kimber is your Speaker. Her talks include stories---case reports and scientific studies. Questions welcome. Healthy joints, bones and muscles allow you to walk, sit, run, dance, pick up, lie down and get up with pleasure. Do you follow these 3 guidelines to keep your joints healthy? Arthritis is a Degenerative disease of the joint. Rheumatoid arthritis joints often contain excess synovial fluid and inflammatory cells. These 3 secrets help keep your joints more flexible. Bones of the human body support us and allow movement. Strong bones require 3 main types of cells and many nutrients besides calcium. Rheumatoid arthritis patients have more infections and die from them more often than peers. Five ways infections can trigger your RA pain. Three ways to help thwart them. Bacteria infecting the gums or the bladder are associated with RA onset in some people. Gum disease is associated with worse RA symptoms. Do these bacteria affect your RA? Can moldy buildings trigger rheumatoid arthritis? Working in a damp building can trigger joint pains. Spores from mold and maybe some bacteria are in the air. Are one of these mold infections triggering your RA pain? Rheumatoid nodules are firm rubbery bumps on top of joints. This article describes what they are, the risk factors, and the possible treatments. Rheumatoid arthritis factor (RF) is an autoantibody because it binds to IgG antibodies. Most RA patients and 5% of healthy people have rheumatoid factors. A diagnosis of seronegative rheumatoid arthritis is more common in patients who had a recent physical trauma such as a bone fracture than a diagnosis of seropositive rheumatoid arthritis. Rheumatoid-Arthritis-Decisions.com provides a Health Assessment Questionnaire so you can follow your progress with new rheumatoid arthritis medication or alternative therapy for rheumatoid arthritis. No matter the state of your bones, joints and muscles, here are the best exercises to get muscle tone and increase flexibility for the elderly, or rheumatoid arthritis patients. Old and new rheumatoid arthritis medications include pain relievers, inhibitors of inflammation, DMARD, and biologics. These 10 questions highlight probable benefits and pitfalls for your RA. Ph.D. scientist explains why rheumatoid arthritis patients have more trouble clearing toxic substances. 24 ways to help rheumatoid arthritis patients subdue toxic substances and reduce flares. An RA flare pounces on its victims, maybe you, doling out pain, more swollen joints, redness, often fatigue and frustration. Many factors trigger rheumatoid arthritis flares –do these trigger yours? Thanks for filling out the RA Flare survey. If you haven't already done it, please visit this page.